When I was a kid, there were two important things I learned about being successful. 1) Brush your teeth every single day and 2) No matter what you do in life, start your own business. As I got a little older, I had to alter #2 slightly to stay current with the times. It now read, "no matter what you do in life, start your own business, but don't f*ck with Beyoncé." Ever since I made that slight addendum, life has been pretty good to me. Somebody didn't get the memo though, and rule # 2 might've just messed up their life. Three Texas natives had the clever idea to start a company called Feyonce, Inc. (not to be confused with Beyoncé of course). Business was booming I imagine, because sometimes when you're typing Beyoncé in Google, you accidentally slide your finger one space up between the G and H and one space over left to the F key instead, and boom, Feyonce. The name reminded me of a brainstorm session my friends and I used to have when we were working on new business ideas. When we couldn't think of anything good,we would stretch out the syllables of words we already knew, hoping to come up with something dope. Words like "Act-ta-fist" or "Corn-bre-duh." A couple of drinks in, and you were rolling with a new soul food joint called Cornbreddah. The tag line went, "Rhymes with cheddah, nobody does it betta." ( I hate that this might be stuck in my head for awhile now.) But that's the story of how Feyonce came about. Somebody landed on a bad idea and forgot to keep guessing. "Defendants adopted the Feyonce mark to call to mind Beyonce and her famous song," the lawsuit said. "Defendants' conduct described herein is intentional, fraudulent, malicious, willful and wanton." Beyonce's lawsuit also seeks unspecified damages, according to Reuters. So here's where the power of rule #2 kicks in. I've read about 10 different articles, all reporting about Feyonce being sued by her big sister Beyoncé. But not one single news source had the courtesy to provide me with a link to the website. So even though I want you to be able to see how terrible it is, you have to promise that you won't buy anything, so that I can stay true to rule #2. 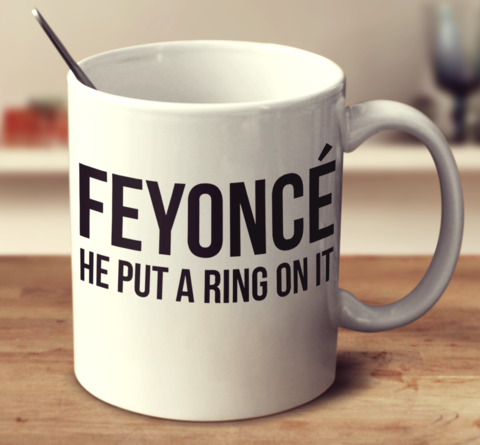 Feyonce put a ring on it, but wasn't smart enough to draft a pre-nup. "And make sure you hit em with the prenup." 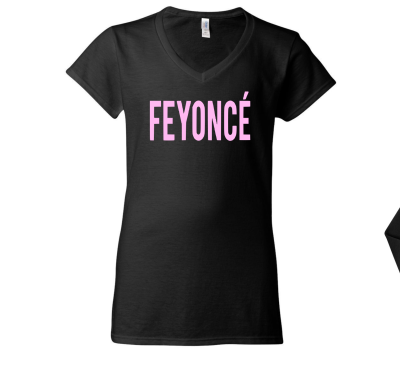 In that same brainstorming session, somebody also thought of the clever idea to use the "Beyonce pink" font and replace the B with an F. It reminded me of when I was a kid and my pops used to take me to the flea market to cop some new FUBU. He always managed to find me new gear in color ways I had never seen before. My friends who couldn't afford it always thought I had exclusives. But before I got too excited, the kids at school would remind me that my "F" looked a little different than there's. I was so happy to get new gear that I didn't notice that my navy blue jersey with lime green trim said "Pubu." The only thing I could think of was to tell them that it was limited edition. But they wasn't going. That whole scene felt like an episode of "Everybody Hates Mike." Just last week, some guy probably in real life ordered his fiancé the mug up above, trying to make up for waiting last minute to get his girl Beyoncé tickets. And now she'll never be able to sip Hennessy out of her $14.95 coffee mug the same. Moral of the story: You might be able to break rule #1 until around lunchtime, but never...ever, ever, ever (Chris Rock voice) break rule #2.